Following a massive party with Jamie Jones, The Martinez Brothers, Chris Liebing and more, we're returning to The Rainbow Venues for part two of our Birmingham 25 Years of DJ Mag celebrations. This time round we're bringing the very best in underground UK dance with none other than DJ EZ heading up the bill. The veteran selector is a legend of the UK garage scene, and has become a something of a national treasure for his skills in behind the decks. Joining him is an allstar cast from across the bass music scene. 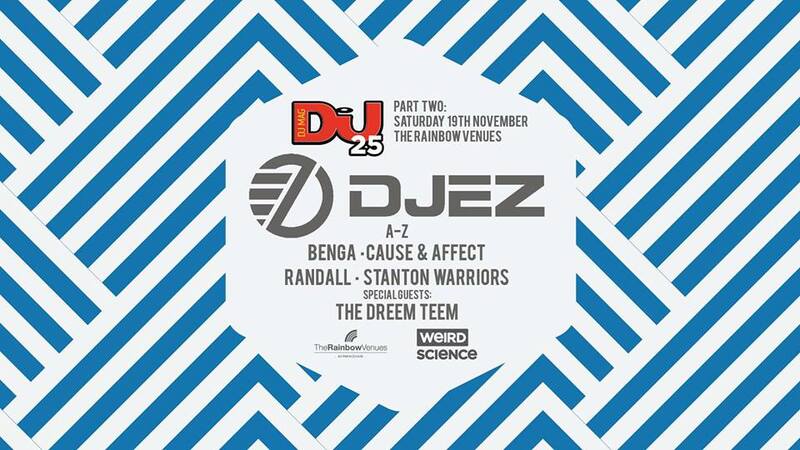 We've got original dubstep pioneer Benga, Birmingham's own bass house dominator, Cause & Affect, jungle stalwart, Randall and breakbeat heroes, Stanton Warriors. Plus we've got a very trio of special guests as Spoony, Mikee B and Timmi Magic hit the decks together as UKG supergroup, The Dreem Teem! All this unmissable action will go down on Saturday 19th November. Tickets are selling out fast so grab one here quickly to avoid disappointment, and join the Facebook event too!